Mod Organizer (MO) is a tool for managing mod collections of any size. Uses Qt licensed under the LGPL. IMPORTANT: This version of Mod Organizer is ancient. Newer versions are available in the Skyrim Special Edition Section and they should be compatible with New Vegas. to experiment with mods and thus need an easy and reliable way to get to install and uninstall them. MO has several unique features not found in any other comparable tool. What mod isolation means is that each mod is installed into its own directory outside the actual data directory. Through some magic MO then shows the game (and any other 3rd party tool that works on the data directory) a "virtual"
data directory that is a merger of the actual data directory and all the mod directories. This way no file ever get overwritten when you install a mod and your data directory can remain in a vanilla state. as far as the game is concerned, they are not there at all. only save games of the specified character are displayed in-game. been used, but as far as I can see, that has no negative impact. Just drop the directory contained in the archive into your game folder (or in any subdirectory of your game folder). When you first start MO you need to set up your first profile. the Fallout variants, rename "omo_mods" to "mods". and immediately run the game (or related tools). 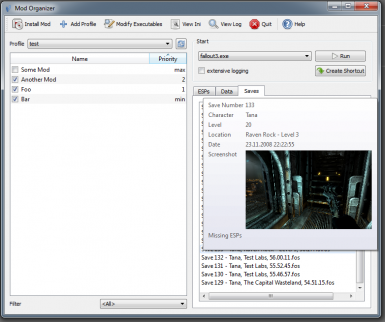 New Vegas or skse for Skyrim), you can have that activate Mod Organizer. NOTE: at the time of writing, skse has not yet been released. activates MO. Currently I use the steam_api.dll for this. Please note that I have only tested this with Skyrim and New Vegas. If you use this last method, please deactivate it from the MO Interface if you want to uninstall MO. If you load MO through either Script Extender or the proxy dll, you can still but do not have to run the game through the User Interface. BOSS, Fake Fullscreen (Oblivion and Fallout), Skyrim 4GB. Please note that these tools will write to the actual data directory (i.e. fomm installing a mod, GECK saving a plugin). These file are then not under the control of MO. MO is compatible to Script Extenders insofar as they work alongside each other. However, since *se works very similar to Mod Organizer, its impossible to guarantee MO becomes active before *se. As a consequence, *se plugins managed through MO may not work. This will also depend on the load mechanism. I'd be very happy to hear about your experiences with this. A: If you have a script extender (obse, fose, nvse or skse depending on the game) installed, best load through "Script Extender"
a FAQ entry here! Also, keep in mind that when using proxy-dll you have to start MO at least once after every game update! If you load through script extender, you need to update it after a game update. are not packaged for easy installation so you may have to shift files around (either during installation or after). Q: I'm using the proxy-dll loading mechanism and now MO/Skyrim doesn't work anymore. - First, deactivate proxy-dll loading in MO then close it. - Now start MO again and re-activate "proxy-dll"
A: First, inside MO, go to settings and select "Mod Organizer" for the load mechanism. Close MO and then just stop using it. no uninstallation is necessary. MO does not write to the registry or into any directory besides its own. is very new, I did not encounter it yet, so you'll have to help me reproduce your situation.